March 31st 2018 was a red-letter day in marine lore. 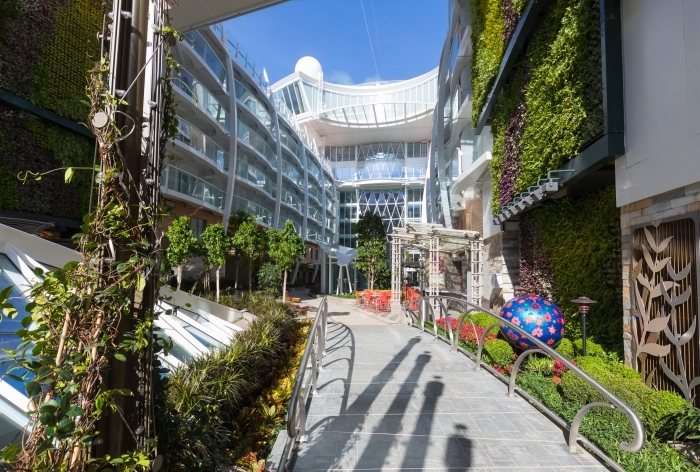 Royal Caribbean's Symphony of the Seas set sail with her first group of passengers. It marks the 25th ship of the fleet – and the largest passenger cruise ship ever built. 5518 guests sail on this architectural marvel of a ship that's 3 and a half football fields long and 2/3 the height of the Eiffel Tower! 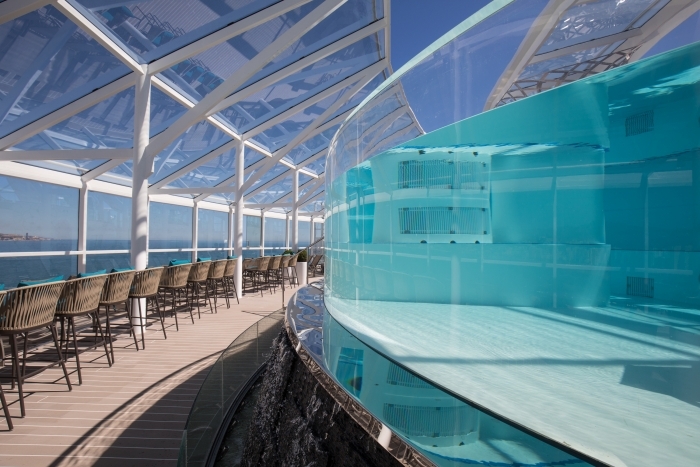 Like other ships in its Class, the aft of the Symphony of the Seas is open to the sea. 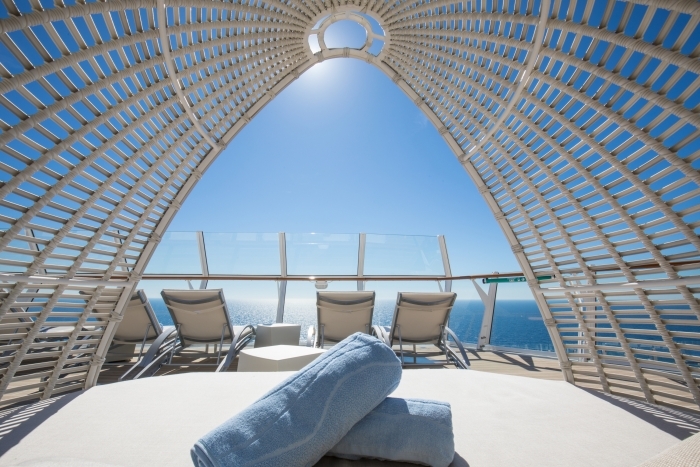 The ship's U-shaped tower has an eye-popping 2759 staterooms overlooking either the ocean, or the Oasis Class' signature, open-air Boardwalk amusement park at sea and lush green Central Park neighborhoods. It sleeps 8, but it's hard to know how much sleep families will get in the new Ultimate Family Suite, two stories of thrills perfect for extended families and sleepovers with the cousins. 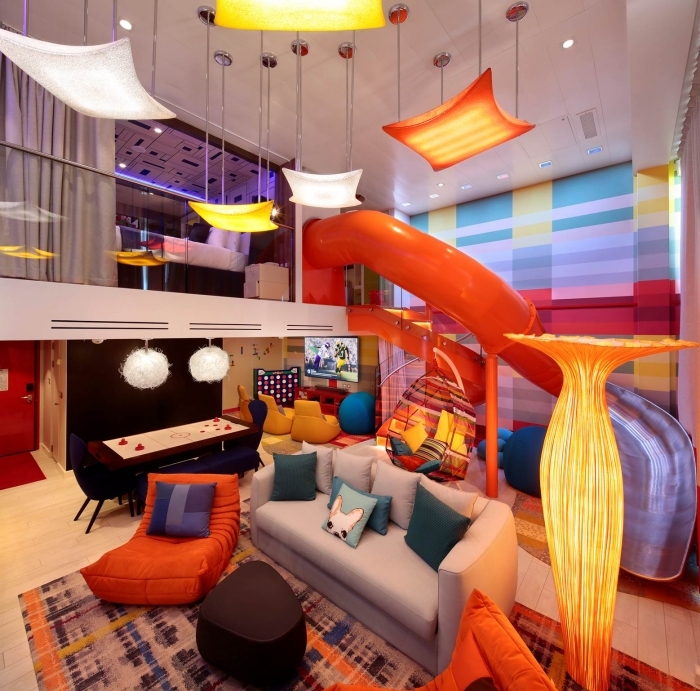 Will you want to leave the suite when there's an in-room slide, private 85-inch cinema TV, a LEGO wall, table tennis and full-sized whirlpool on the balcony and a 'Royal Genie', Royal Caribbean's fun version of a butler? It will be hard to stay indoors. 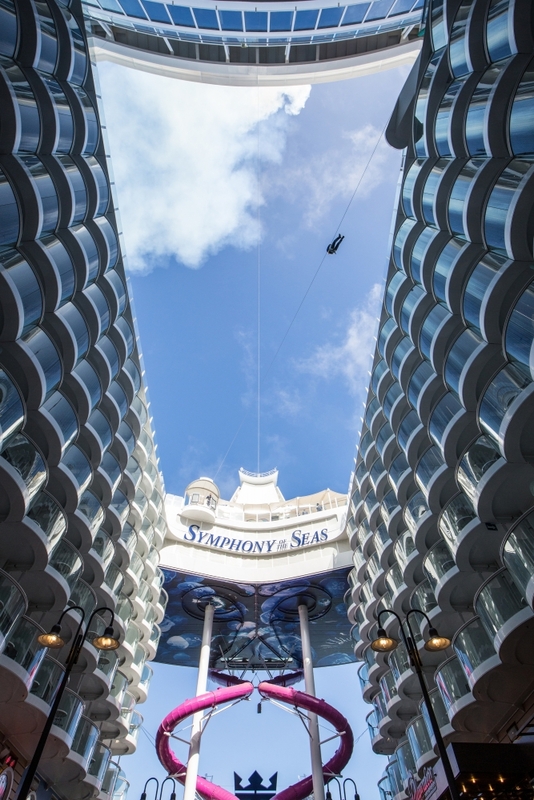 They've packed a lot of unforgettable cruise moments into this record-breaking ship. 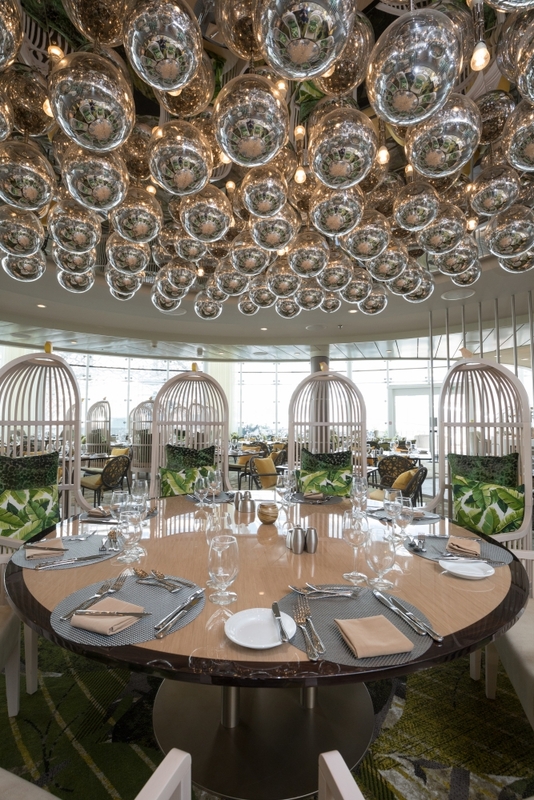 The Rising Tide bar on a pedestal lifts and lowers guests up multiple decks in the heart of the ship. Robots tend the Bionic Bar (see them in action in this video). The al fresco AquaTheater at the signature, open-air aft of the ship is home to breathtaking high-diving and aerial acrobatics against an ocean backdrop with a brand-new show. 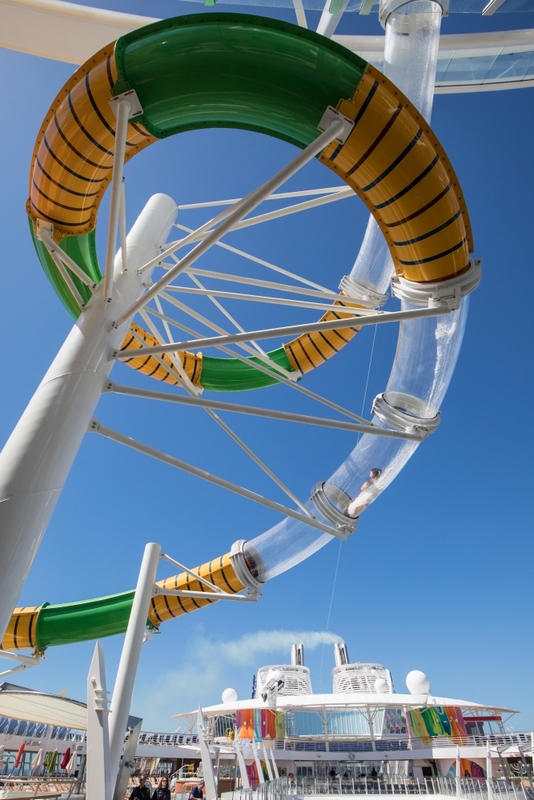 And there's more adrenaline than ever, with three waterslides, a zipline across the open ship's cavity, surf simluators, and the Ultimate Abyss, the tallest slide at sea, shoots thrill-seekers from the top deck to the heart of the Boardwalk decks below. Battle for Planet Z is Royal Caribbean’s first, glow-in-the-dark laser tag game. The custom-built escape room Escape the Rubicon has you, family, and new friends in a Rubicon submarine solving puzzles against the clock. Hooked Seafood with vast ocean views out the front of the ship, upscale but accessible New-England inspired seafood, with a raw bar and oysters shucked to order. Is it a Sports Bar or Spectacle?At the Playmakers Sports Bar & Arcade stretching the length of the re-imagined Boardwalk, 31 big-screen TV's blast the game. 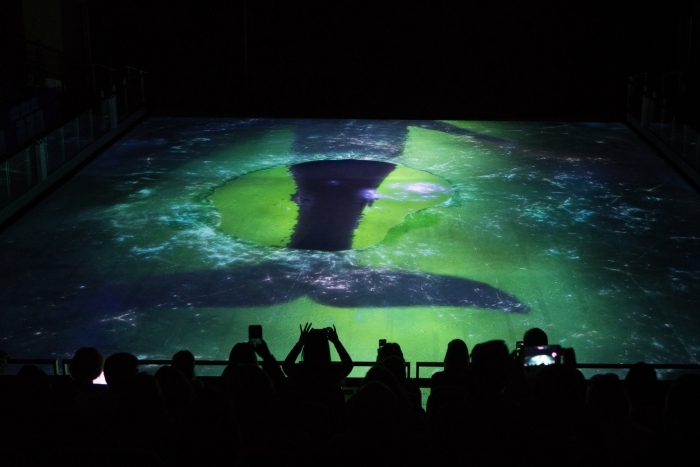 New technology debuts on the Symphony of the Sea too. Mobile check-in, facial recognition, bar codes, and apps eliminate lines and get you vacationing sooner. Symphony of the Seas homeports in Barcelona for the summer of 2018, on itineraries that include dreamy Mediterranean ports like Palma de Mallorca, Provence, Florence, Rome and Naples. 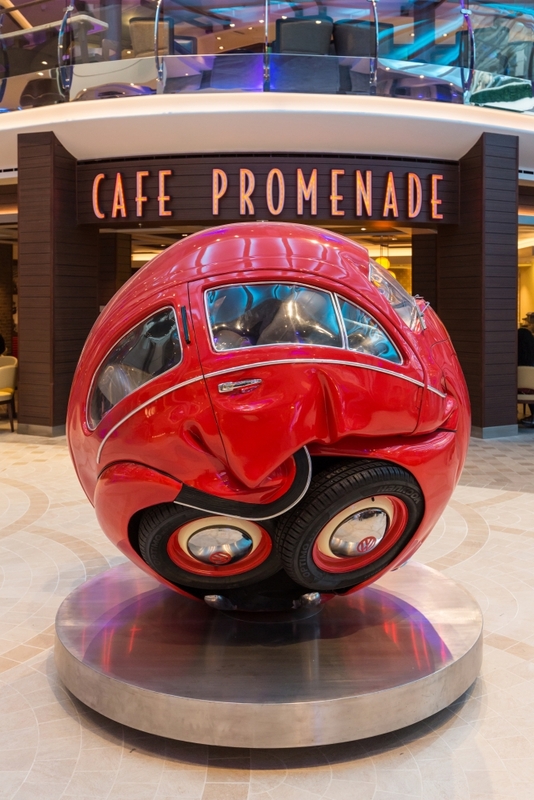 Then she'll reposition to her new homeport of Miami for 7-day Eastern and Western Caribbean cruises year round that will include calls on Perfect Day at CocoCay, Royal Caribbean's new private island destination in the Bahamas.